Chimney swifts are forming migratory flocks right now that can be seen at dusk all around the area. In areas where there are large chimneys flocks of hundreds of individuals can be seen spiraling down into the chimney tops to roost for the night. 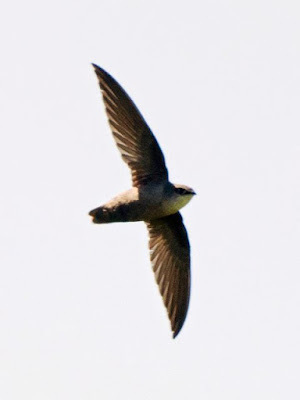 If you know of such a roosting site, or had nesting swifts in your chimney this year, take some time to fill out the form at the web address above. 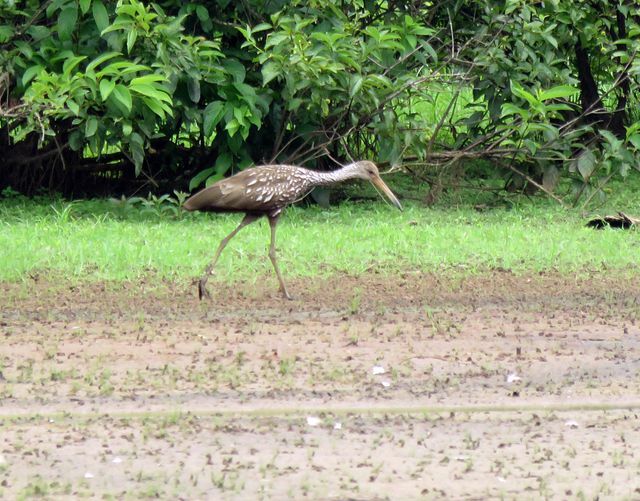 Yet another locally rare shorebird was located recently along the Catawba River, right where Wilkinson Boulevard crosses the river into Belmont. A willet apparently was grounded by the storms late last week and spent a day on the exposed mud just north of the bridge. 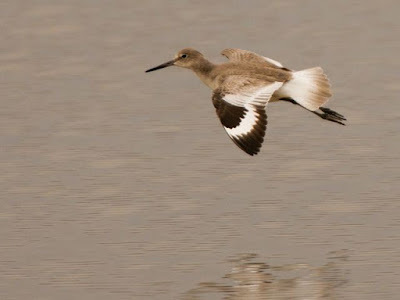 Willets are large shorebirds. They are familiar sights as they wade into the surf along our beaches. They are a non-descript gray color until they take flight, revealing the striking black and white wing pattern that makes identification easy, even on distant flying birds. They are rare in the piedmont though. There are about three records for Mecklenburg County. I tried to find the most recent bird but was unable to get out on the day it was discovered. As happens so often with rare birds during migration, it had moved on by the next day. Below are two shots of the willet found along the Catawba River where Wilkinson Blvd crosses the river. Note the gray plumage and large size. This bird was grounded by heavy rains and unsettled weather. 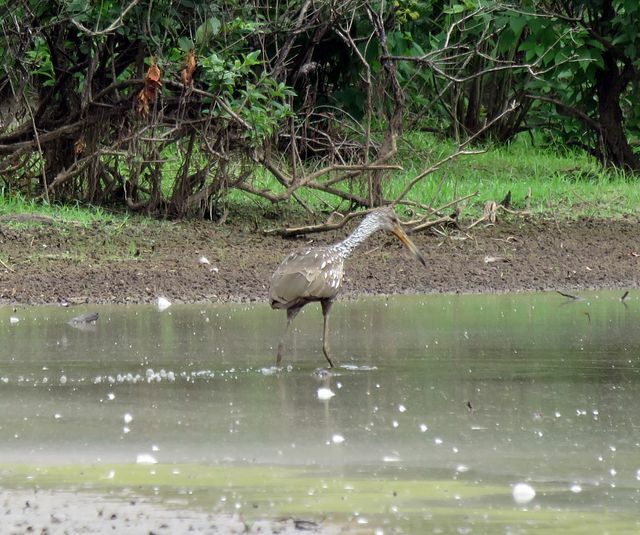 even as these photos were being taken the water was rising, eventually covering up the exposed mud bar where the bird was foraging. In flight the willet is easy to identify. Simply look for the striking black and white wing pattern on the spread wing. Fall migration, while in its early stages is nonetheless in full swing right now heading for a peak in about the third week of September. As August winds down and Labor Day approaches, there are some opportunities to observe the movements of some species through our area. Start watching for common nighthawks late in the evenings. They will be flying overhead most noticeably around 7:30 PM to 8:00 PM. Sometimes the loose flocks can be rather sizable, numbering a few dozen birds. Typically the number of individuals is much less but it is uncommon to see only one bird. If you see one, look around closely. They will be flying in the same direction. They are also often seen around the lights at area stadiums uptown. Some folks think they are bats but the nighthawks are much larger. 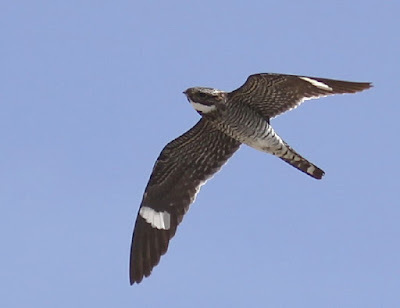 Recognize nighthawks by their larger size, long angular wings with two vertical white bars visible from the underside, and white throat. 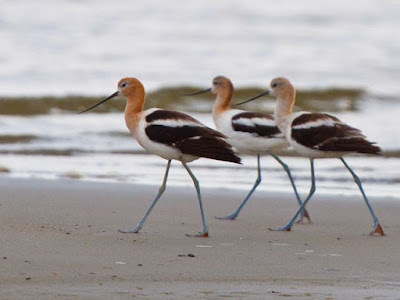 I was finishing lunch in Mint Hill last Saturday when I got the call: a flock of American avocets had been found on a large mudflat on the southern shore of Lake Norman. I had not previously seen that species in Mecklenburg County so I immediately postponed some household chores and headed the birds’ way. Thanks to 70 mph speed allowances and the I-485 connector to I-77, I arrived in about 35 minutes. I needn’t have hurried so. A beautiful flock of 10 American avocets was loafing in the shallow water just off the flat. 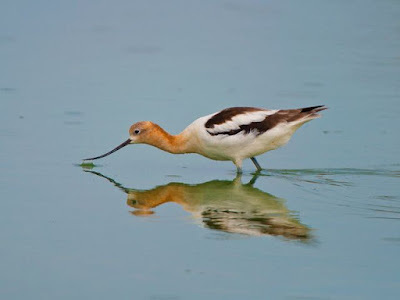 American avocets are among the most spectacular and elegant shorebirds in North America. They are large and strikingly colored with a cinnamon-colored head and neck, black and white wing stripes, and blue legs. But the most unusual thing about avocets is their bill. The bill is long, thin and turns upward. Avocets sweep it sideways in the shallows to catch small invertebrates. American avocets breed over a large portion of the country west of the Mississippi River. They spend the winter sparingly along the southeastern coast, arriving in august and September. I suspect the Lake Norman flock was heading for a barrier island off the Carolina or Georgia coast. The birds varied in plumage with the fading cinnamon head parts still visible in some individuals while others had those areas white. They may have been immature birds or adults that had already molted away the cinnamon plumage. The sighting is just the second county record for the species. I feel really fortunate I was in town and answered my phone to get the report. By 7:45 the next morning the flock had moved on. I can go a couple of years nowadays without adding a new bird species to my county list. As I have mentioned several times in the last month, there is a load of shorebird habitat right now along the Catawba River and smaller ponds. Water levels are low and in the next month I suspect more highly unusual sighting will come to light as shorebird migration peaks. Conditions are this good every ten years or so. If you encounter shorebirds try to snap a photo and send it to me. I am interested in seeing what is coming through. 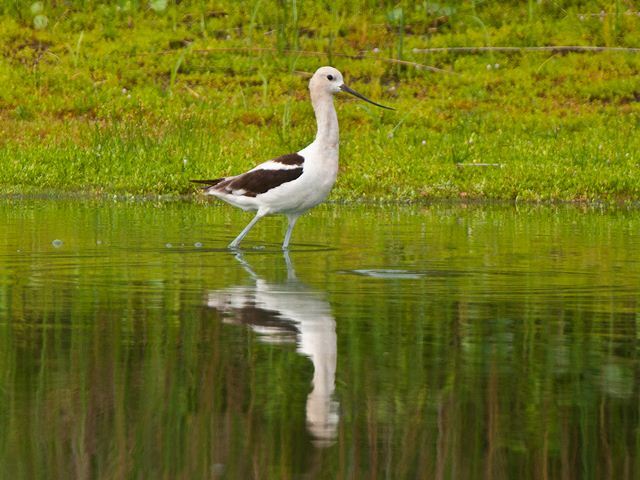 In breeding plumage the American avocet is quite striking. Note the odd upturned bill. Even in non-breeding plumage the birds are quite elegant. American avocets are flocking birds, rarely encountered alone. I have written about my quest to see as many species of birds in Mecklenburg county as I could in 2014. I ended up in a tie with the previous high number of 205 species. One bird I missed that year was the white ibis, a species I figured I could find with a little bit of hard work. It wasn’t to be. Yesterday I got word that a probable white ibis was at an old cow pond in Mint Hill. I hustled over and sure enough, an immature white ibis was wading around in the shrinking pond with a great egret. Only about eight months late, but it was still nice to see this species that is pretty tough to find in the county. The immature bird below is pretty much in the same plumage as the Mint Hill bird from yesterday. The vast majority of white ibis that come into the Piedmont during the summer are immature / juvenile birds in this brown and white plumage. The adult birds, one of which is shown below, more accurately reflects the name of the bird. the plumage is all white except for solid black wing-tips that are seen well only in flight. Many Florida residents visit North Carolina during the summer months. 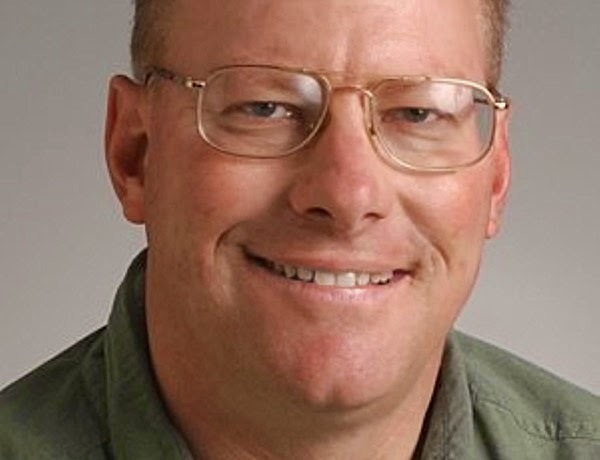 Until recently that referred to humans only, but birders statewide are enjoying another visitor from the Sunshine State in the upper reaches of Lake Norman. Birders have been coming from all over to add this limpkin to their NC State List, and with good reason…the last time a limpkin showed up in the state was 1998. For now the bird is content with its mudflat under a railroad trestle spanning the lake. Currently it is accessible only by canoe, boat, or kayak. But birds move around. When it decides to move it could show up anywhere in the area. 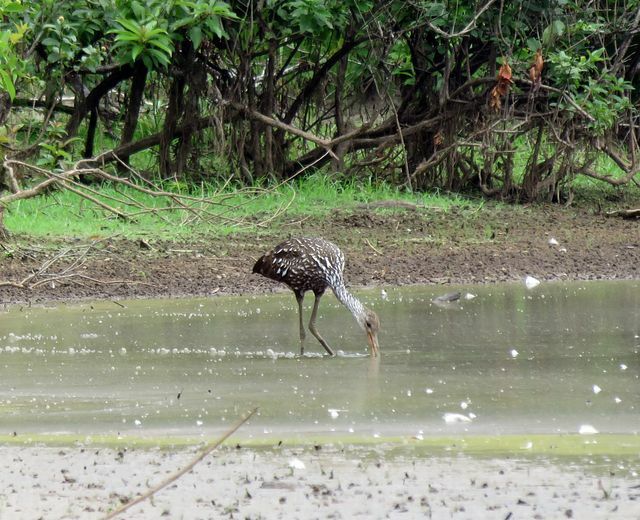 Here are some photos of the limpkin taken by Lori Owenby. 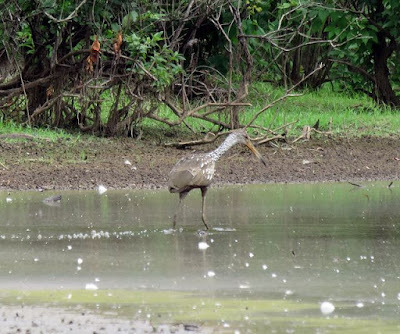 Note the long legs and brown plumage flecked with white. The pattern is similar to that of immature night-herons, but the limpkin has longer legs and a longer, thinner bill.